Fittingly, Peggy Fortner was presented with a globe as a remembrance of her 16 years heading the Law Center's graduate studies program which attracted foreign-trained attorneys from around the world. 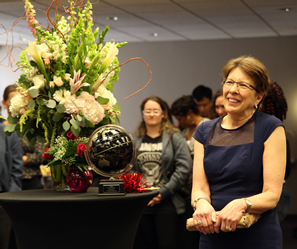 April 5, 2017 — Colleagues and students gathered last week to bid farewell to Peggy Fortner who is retiring after directing the University of Houston Law Center's graduate studies program for 16 years. Surrounded by current and former students at a reception in the Hendricks Heritage Room, Fortner was praised as a mentor and guide, especially to foreign-trained attorneys who come to the school from around the world to earn an LL.M. degree in one of six specialty areas. Under her direction, the graduate program has grown from an entering class of 19 foreign students in 2001 to a high of 59 by 2014; the number of U.S. attorneys entering the program each year during that period averaged nearly 50. During her tenure, the school has awarded more than 1,100 LL.M. degrees to U.S. and foreign attorneys who came from 84 countries. "This has been an amazing experience," Fortner said of her years at the Law Center. "I've had the opportunity to meet a wide array of people, and it has opened my eyes to the world. An international news event is now more than a spot on the map. It is the face of a former student." "Peggy is a wonderful person who is very kind," said Dean Leonard M. Baynes. "She treats everyone with respect and is very inclusive in her operations. The Law Center had been blessed to have her supervise the LL.M. program for all these years. We really appreciate that she plans to continue to work part-time after her retirement." At the reception, Professor Peter Linzer said Fortner has been integral to the great success the Law Center has enjoyed over the years. While Research Professor Ronald L. Scott said she has not only been a friend, but a guide and mentor to foreign students, helping them acclimate to the school as well as Houston and the United States. Scott annually teaches "Introduction to American Law," the first class foreign students attend at the start of the school year. Fortner came to the Law Center from the American Institute of Architects where she worked as assistant executive director. For the previous 23 years, she served as career development director at South Texas College of Law. Fortner's first year was memorable for her— and a rocky introduction to the United States for the foreign students — because of the obstacles presented in the aftermath of Tropical Storm Allison; storm and flood damage forced orientation to be held on the floor of Hofheinz Pavilion, and classes for the first two weeks were held in the architecture building. Shortly after the semester began, terrorists brought down the World Trade Center. Fortner will continue to work part-time until her successor is named. In retirement, she and her husband, Ken, who is retired from a career in medical and pharmaceutical sales, plan a cruise along the Iberian Peninsula from Portugal to Barcelona, and then intend to spend plenty of time with their children and two grandchildren. Their son, Ryan, of Houston, is a MUD tax specialist, and their daughter, Sarah, is an emergency room doctor in Salt Lake City. Fortner keeps in touch with many of her former students and occasionally runs into one years after he or she has graduated. During their year at the Law Center, she tells the foreign students, only half joking, that she may someday take a trip around the world and show up at their door. "I am very glad that I had the opportunity to be a part of their educational journey."